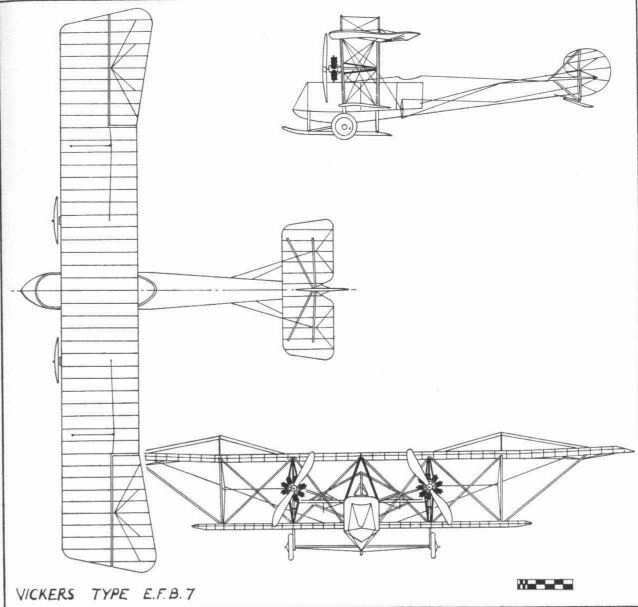 Shortly after the start of the first world war Vickers engaged Howard Flanders to design a new twin-engined fighting aeroplane to carry a Vickers one-pounder gun. Classified as the E.F.B.7, it was powered with wing-mounted Gnome monosoupape engines, and the pilot was seated behind the wings and the gunner in the nose. 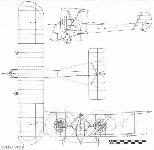 It flew some time in August 1915, and thus vied with the comparable French Caudron and other designs for the claim of being the first twin-engined military aircraft to fly successfully. However, in the E.F.B.7 the distance separating the two-man crew was found unacceptable in practice; in the variant, the E.F.B.7A, the pilot was brought forward of the wings, just behind the gunner. An attempt to reengine this Flanders-designed machine with two 80 hp air-cooled Renaults (because of the shortage of Gnomes) was unsuccessful, as the loss of some 40 hp meant a serious drop in performance. In consequence, a contract for 11 F.B.7 aircraft being built by Darracq and Company (1905) Ltd of Townmead Road, Fulham, was cancelled. The E.F.B.8, which appeared in November 1915, powered by two Gnome monosoupapes, was smaller than its predecessor and carried only a single light Lewis gun, which could be accommodated equally well in single-engined types. This redesign was entrusted to Pierson, who stored the knowledge gained and revived it when a new twin-engined bomber was called for from Vickers by the Air Board in 1917. F.B.7. To provide an all-round field of fire for its Vickers 1-pounder automatic gun, this two-seat fighter, which appeared in the summer of 1915, was given two engines. No details of the gun mounting have survived, though it is said to have been bolted to the thick duralumin floor of the cockpit and would thus have differed in principle from that later described in connection with the F.B.24E. Nevertheless, the gunner's seat is said to have traversed with the gun. 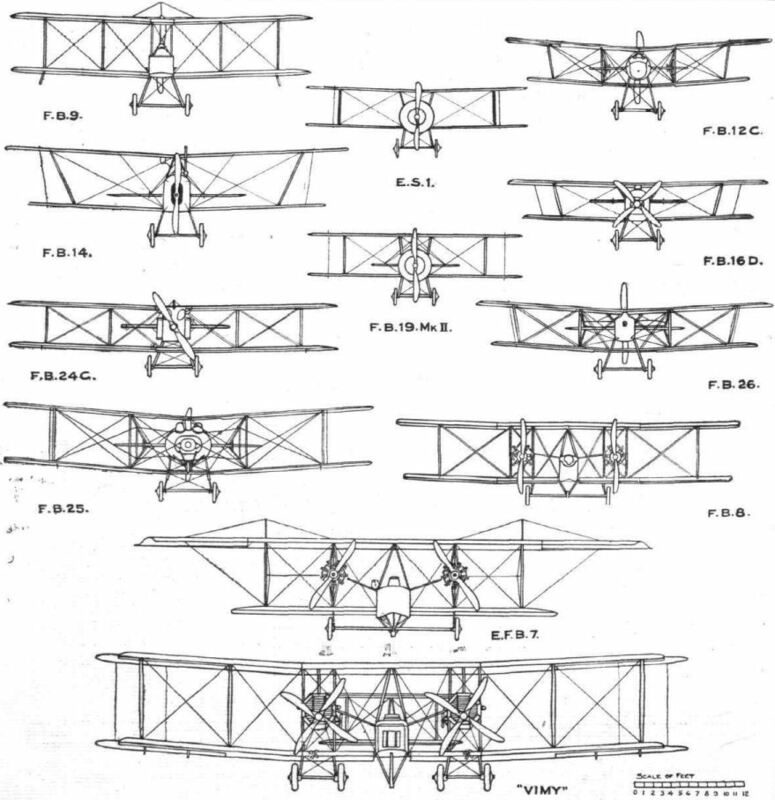 F.B.8. Late in 1915 Vickers built this two-seat fighter, laid out generally along the lines of the F.B.7 but armed only with a Lewis gun. This was emplaced in the nose at the front of a narrow cockpit and appears to have had a restricted field of fire. The Vickers E.F.B.7 a twin-engined fighter designed for Vickers by Howard Flanders. The engines were Gnome Monosoupape of 100 hp mounted between the wings. It was designed to carry a Vickers one-pounder gun in the front, which made the arrangement that the gunner was in the front and the pilot way back behind the wings. The machine flew in August 1915. It was not succesfull and a modification was made (designation E.F.B.7A) where the pilot was placed directly behind the gunner. Also the engines were changed due to the scarcity of the Gnomes, making it far less powerful, so dropping the performance unacceptably. Only this one (5717) was built. Vickers attempted another twin-engined fighter - the E.F.B.8 - but this did not work out either. 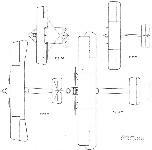 The machine could be distinguished by the equal span wings, where the E.F.B.7 had unequal span wings. 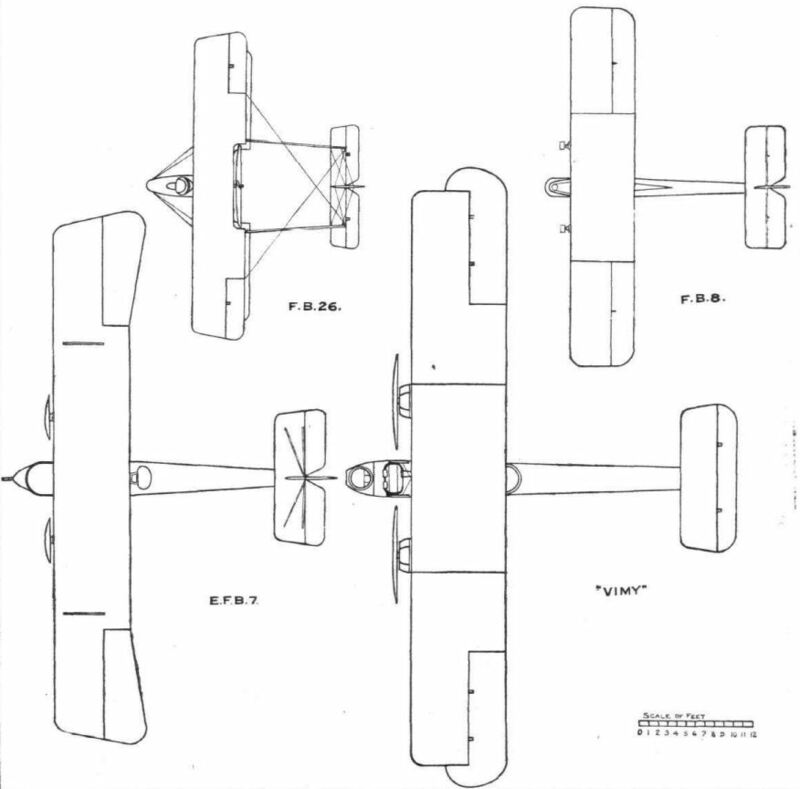 On the outbreak of World War I, Vickers engaged R L Howard-Flanders to design a twin-engined fighting aeroplane capable of carrying a Vickers one-pounder quick-firing gun with armour protection for the gunner. 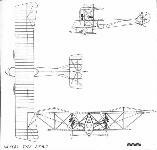 Powered by two 100 hp Gnome Monosoupape nine-cylinder rotaries mounted overhung between the mainplanes and suspended on simple steel-tube open framework, the prototype was designated E.F.B.7 and was flown for the first time in August 1915. 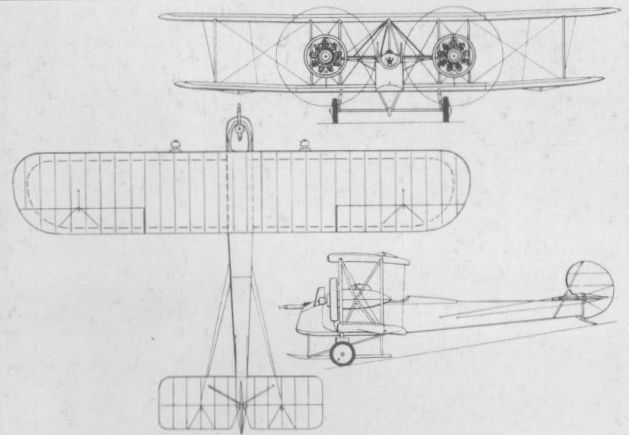 An ungainly unequal-span biplane with two bays of struts, the E.F.B.7 accommodated the pilot aft of the mainplanes, several feet from the gunner in the extreme nose. The substantial gun mount was bolted to the centre of the forward cockpit floor, the gunner’s seat being attached to the mount with which it traversed - sufficient room was provided in the cockpit to permit gun and gunner to turn through a full 360 deg. The E.F.B.7 was one of the first twin-engined military aircraft to fly successfully, and an order for 12 production F.B.7s was placed on 20 August 1915, immediately after the initial flight tests of the E.F.B.7, but, in the event, the series model was to differ in a number of major respects. The distance separating the two-man crew was found unacceptable and the pilot was brought forward of the wings in sensible proximity to the gunner, the structure of the upper wing was completely redesigned and the fuselage was revised in cross section, becoming rectangular throughout rather than having an inverted triangular cross section aft. Owing to a shortage of Gnome rotaries, the first production aircraft was fitted with 80 hp Renault eight-cylinder air-cooled engines as the F.B.7A, the engine change resulting in a major loss of performance. As the F.B.7A obviously possessed no operational usefulness, Vickers persuaded the War Office to cancel the contract for the remaining aircraft (which were being built by A Darracq & Company at Fulham under subcontract). The following data relate to the Gnome-engined E.F.B.7. Max speed, 75 mph (121 km/h) at 5,000 ft (1525 m). Time to 5,000 ft (1525 m), 18.0 min. Ceiling, 9,000 ft (2 745 m). Empty weight, 2,136 lb (969 kg). Loaded weight, 3,196 lb (1450 kg). Span, 59 ft 6 in (18,17 m). Length, 36 ft 0 in (10,97 m). Wing area, 640 sqft (59.46 m2). Although possessing a superficial resemblance to the F.B.7, the F.B.8. designed in the autumn of 1915 by Rex K Pierson, was a very much smaller, lightly-armed two-seat fighter carrying only a single 0.303-in (7,7-mm) Lewis gun as armament. Powered by two 100 hp Gnome Monosoupape rotaries, the F.B.8 began flight testing in November 1915, and performance proved to be good. The gunner was accommodated in the extreme nose and the pilot was seated beneath the trailing edge of the upper wing. 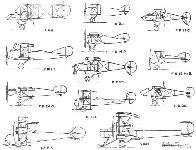 From the outset, it was obvious that the armament carried by the F.B.8 could equally well be accommodated by a smaller, single-engined aircraft, but it had been hoped that an appreciably higher performance could be obtained by doubling the power available. Insufficient attention had been paid to the drag of such an aircraft, however, and performance proved lower than had been anticipated. Furthermore, the aircraft was insufficiently manoeuvrable for fighting duties and was discontinued. Max speed, 98 mph (158 km/h) at 5,000 ft (1 525 m). Time to 5,000 ft (1525 m), 10 min. Service ceiling, 14,000 ft (4 270 m). Empty weight, 1.840 lb (835 kg). Loaded weight, 2,700 lb (1225 kg). Span. 38 ft 4 in (11,68 m). Length, 28 ft 2 in (8,58 m). Height, 9 ft 10 in (3.00 m). Wing area, 468 sq ft (43,48 m2). 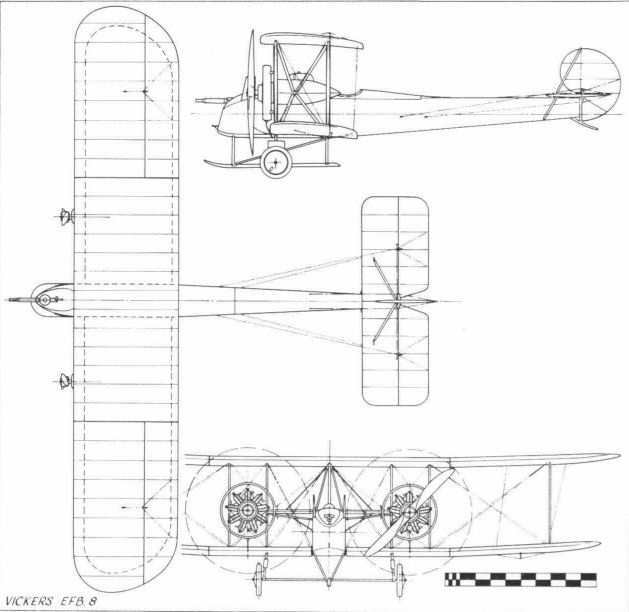 The Vickers F.B. 7 was probably one of the first twin-engined machines to take the air. The, first flights were made in August, 1915. The power plant consisted of two 100 h.p. 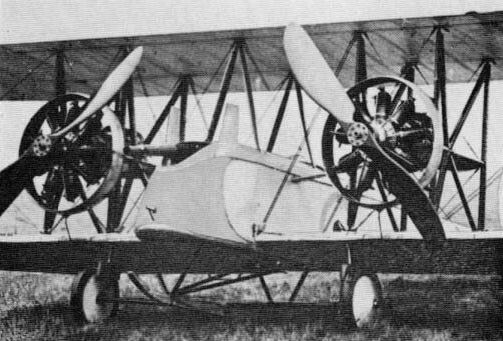 monosoupape engines, and the machine was designed to carry a Vickers 1-pdr. auto-gun. The Government looked upon the machine favourably, and ordered 12 similar ones. Information was afterwards received that the monosoupape engines were not available, and a request was made to substitute 80 h.p. Renault engines. This modification involved a considerable loss of power at a time when aeroplanes had little or no reserve. Realising that the machine would not be a success with the lower-powered engines, the Government was requested to cancel this contract, and this was accordingly done. The machine, however, will always be of interest as the forerunner of the now famous "Vimy." In November of the same year, a smaller twin-engined machine was constructed to carry a Lewis gun, but it soon became apparent that the same armament could be more effectively employed with a similar engine, but a smaller and handier machine. The type, therefore, was speedily abandoned. It is of interest to note that this was the fastest twin-engined aeroplane in 1915. 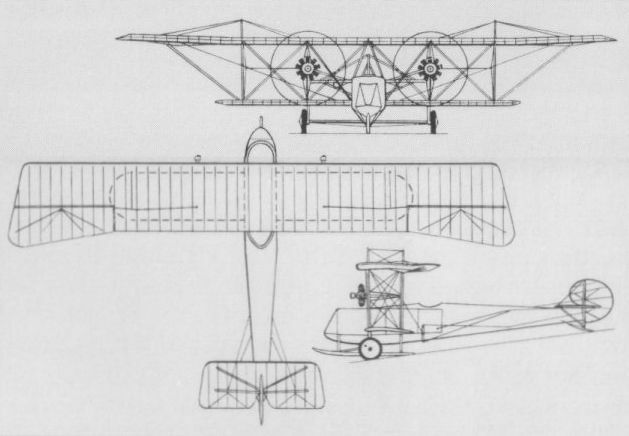 Flanders-designed E.F.B.7 in original form with Gnome monosoupape engines, and pilot behind wings. Installation of Lewis gun on Vickers F.B.8. The gun retains its land-service type cooling jacket, as on the standard Gun Buses. 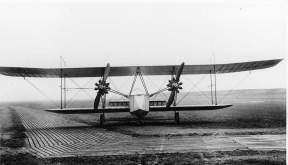 The E.F.B.7 with engine cowlings removed. 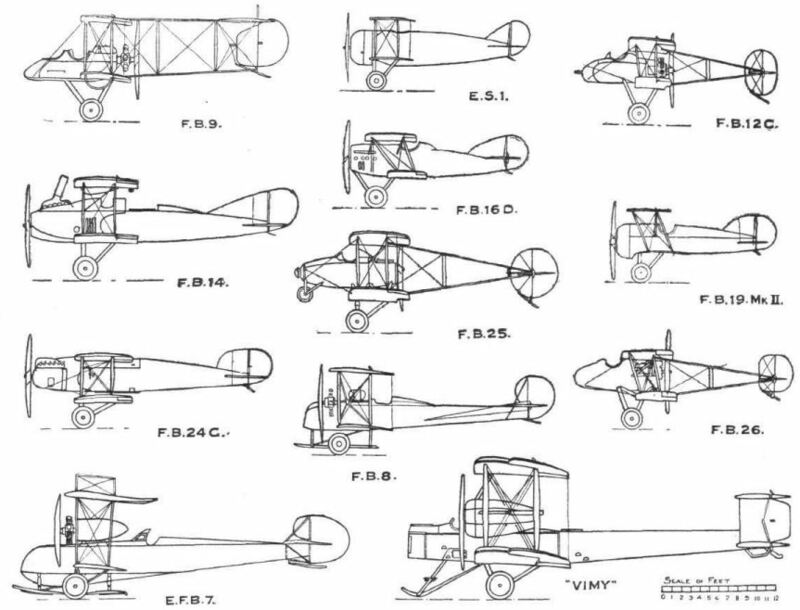 Only a single example was built of the F.B.8, developed from the F.B.7.